A neurotoxin is a toxic agent or substance that inhibits, damages or destroys the tissues of the nervous system, especially neurons, the conducting cells of your body's central nervous system. This is an example of a cytotoxin. Neurotoxic effects can include behavior changes, seizures, as well as wide range of effects, including death. See the links under Further Reading for specifics. One unfortunately common neurotoxin is the linear chain alkane, n-hexane, a commonly used solvent and degreaser. OSHA has issued an Occupational Safety and Health Guideline for n-Hexane. OSHA's permissible exposure limit of 500 ppm for this material is believed by some experts to be at least an order of magnitude too high to adequately protect workers. The other (branched) isomers of n-hexane do not exhibit neurotoxicity, so consider switching one of those or heptane to avoid workplace exposure. MSDS's will normally warn the reader of neurotoxic dangers. Both acute and chronic (long and short-term) exposure to certain organic chemicals can cause a variety of health problems including narcosis, anesthesia, CNS (central nervous system) depression, respiratory arrest, unconsciousness, coma, and death. See the first link below for more information. Treat neurotoxins with great respect. The potential for long-lasting or permanent effects from exposure means you should avoid the use of neurotoxins whenever possible. 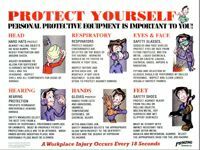 If you must use them, use proper controls to minimize the number of exposed workers (such as fume hoods) as well as personal protective equipment such as respirators, gloves etc. NIOSH has a good article titled Organic Solvent Neurotoxicity. The University of Washingtons' web site "Neuroscience for Kids" has a page on neurotoxins, including lots of info on naturally venomous animals. The U.S. EPA's National Center for Environmental Assessment's Guidelines for Neurotoxicity Risk Assessment. Read this Centers for Disease Control (CDC) document n-Hexane Related Peripheral Neuropathy Among Automotive Technicians --- California, 1999--2000. A Comprehensive Listing of Neurotoxins by NeuroResearch. See also: cytotoxin, poison, systemic, toxic.